Hey Forklift Fans – We’ve got a bunch of August workshops at the Forklift for folks about tools, upcycling, and the secrets hiding in old houses. But our partners at Tanglewood Works also have really fun, hands-on classes coming up too! Sign up soon, because their classes tend to fill up very quickly. 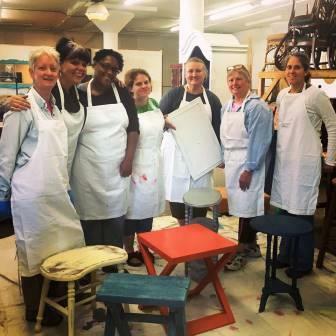 Bring in your own piece in this half-day workshop and paint it with the help of Sue Older-Mondeel, Senior Dumpster Diva at Tanglewood Works. This shop at the front of the Forklift warehouse is a fusion of art and upcycling as they turn discarded items into beautiful treasures. Bring an item that is small enough that you can carry it with one hand that has enough flat surfaces to experiment with different finishes. Try to avoid too many spindled items as you will spend more time covering the surface than trying out fun techniques. This advanced offering is for those who have completed either the Renegade Chalk Paint Class or the Debi’s Design DIY Chalk Paint Class. Included with the workshop is a quart of the paint color of your choice, as well as the brushes and waxes needed to complete your masterpiece. Snacks and beverages will be provided. For more info or to register, visit the Eventbrite page. For more info on future workshops at Tanglewood Works, visit their blog page.